The Drew University Graduate Division of Religion is pleased to announce its 18th Transdisciplinary Theological Colloquium to be held on March 30th and 31st, and corresponding Graduate Student Symposium on March 29th, 2019. The conversations will be centered around our conference theme: Political Theology at the Edge: Collectivities of Crisis and Possibility. This TTC, like every other, takes place between and beyond disciplines. It hopes to recharge the practical theorizing of political theology at the gathering point of the crises of the present. That present – irreducible to its future-trumping U.S. regime, indeed to any exceptionalist power – finds itself at multiple, shifting edges. The intersecting politics of race, immigration and gender, of sovereignty, democracy and economics, of religion and authoritarianism, seem to converge along the eerie edges of climate change and environmental collapse. Eschatology turns apocalyptic. But then again, we may remember that the eschatos of eschatology might re-signify “end” as “edge,” a rim or verge; spatial as well as temporal. Of course, we may – as nation, as civilization, even as species – go over it. Or might a political theology of our entangled materiality catalyze edgier practices, eschatoi of unguaranteed possibility? For schedule and presenter information, visit the conference website! Get driving directions, lodging info, & view the campus map on our Maps & Directions page. 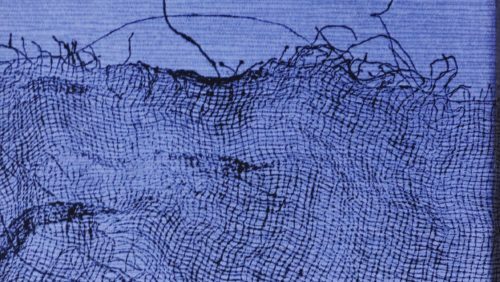 Banner Artwork: Frayed | Hilos, 2018 © Yohana Junker, image used with permission.